These tips will turn you into a safer and smarter driver. For most Pinays these days, it's perfectly normal to spend a good amount of your time on the road. What used to be a 30-minute drive to work can now end up being an hour-long crawl in traffic. It's even worse on pay days and long weekends. Because you're in your car more often than before, it pays to know some driving techniques that will make you look like a total pro behind the wheel. These hacks are a godsend and might just make your life on the road a bit more bearable. Remember what your driving instructor told you: eyes on the road and hands on the wheel. If you're with a companion, ask him or her to put your phone on speaker mode or type the message for you. Obviously, you can't do that when you're alone, though. 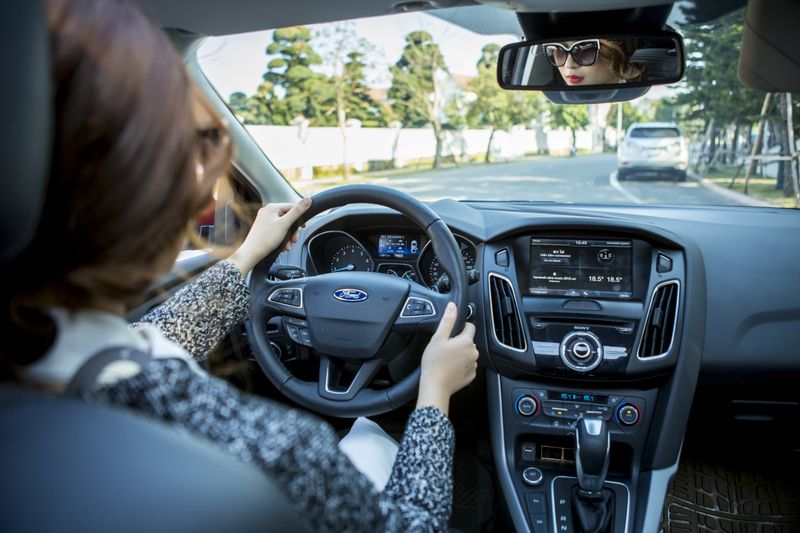 Good thing in a vehicle like the Ford Focus, its voice-activated hands-free system SYNC 2 will make the call for you. Just pair your mobile phone, activate the call feature through voice command, and you're all set. No need to take your hands off the wheel. There's no need to feel ashamed if parking is not your strongest suit. You can watch those video tutorials online and practice, or you can also get by with a little help from parking aids such as the Enhanced Active Park Assist found in the Ford Focus. A push of a button signals the system to look for a parking slot. Once it finds one, it will prompt you to let go off the wheel and just set your foot on the gas or brake pedals. Then, it will steer the car into the parking. Parallel or perpendicular parking is now a cinch. This can get tricky especially in tight spaces. One thing you can do is ask parking boys to assist you, but you can't always find one. If you're in a Ford, however, the Enhanced Active Park Assist will again do wonders for you. Its Park Out Assist feature will help you exit the parking slot with just a touch of a button and a few taps on the gas and the brake. For one, you can plan your errands and map out your route ahead of time. You can also avoid abrupt braking or stomping on the gas. But with modern technology like the EcoBoost engine of Ford Focus, you become an instant fuel saver. No, the Focus is not slow at all. It's responsive and also fuel-efficient. Ideally, you should already be holding your car key before you even get out of the door, so you can get in the vehicle right away. This is not just to save time but also to keep you safe. Fortunately with the Ford Focus, all you need to do is place your key fob in your pocket and you can get in the vehicle just by touching the door handle. Thanks to its keyless entry feature, you don't have to take out your key anymore. You can practice what you've learned in yoga class like breathing consciously so you're relaxed behind the wheel. But when you're snaking through a maze called the streets of Metro Manila, that meditative state can be gone in an instant if a car in front of you brakes abruptly or if another vehicle decides to cut into your lane. Good thing the Focus is equipped with Active City Stop, which will apply brakes when you are driving at 50km/h or below, to help avoid collision or minimize impact. Again, you can choose to say namaste, or you can start singing your favorite song when you feel like you're about to give in to road rage. In the Focus, you can play music by activating SYNC 2 through voice command. You also have controls on the steering wheel so you can pick your tunes. Polish your pedal footwork to make sure your car won't roll backwards as soon as you shift into drive when you're starting from a hill. You can also rely on the nifty feature of Focus called the Hill Launch Assist that will engage automatically when you're parked on a steep surface. Driving aids also help. The ABS (anti-lock braking system) works with the Electronic Stabiliy Program (ESP) of the Focus, which prevents your vehicle from skidding and sliding off the road, giving you a smoother and more stable journey ahead. The trick here is to get a dedicated charging cable for your car. New car models like the Ford Focus are fitted with USB ports and even a power socket to make sure that your mobile device will stay on.